Steven Paul "Steve" Jobs (February 24, 1955 – October 5, 2011) was an American information technology entrepreneur and inventor. He was the co-founder, chairman, and chief executive officer (CEO) of Apple Inc.; CEO and largest shareholder of Pixar Animation Studios; a member of The Walt Disney Company's board of directors following its acquisition of Pixar; and founder, chairman, and CEO of NeXT Inc. Jobs is widely recognized as a pioneer of the microcomputer revolution of the 1970s, along with Apple co-founder Steve Wozniak. 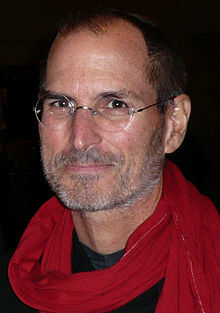 Shortly after his death, Jobs's official biographer, Walter Isaacson, described him as the "creative entrepreneur whose passion for perfection and ferocious drive revolutionized six industries: personal computers, animated movies, music, phones, tablet computing, and digital publishing. Jobs co-founded Apple in 1976 to sell Wozniak's Apple I personal computer. The duo gained fame and wealth a year later for the Apple II, one of the first highly successful mass-produced personal computers. In 1979, after a tour of Xerox PARC, Jobs saw the commercial potential of the Xerox Alto, which was mouse-driven and had a graphical user interface (GUI). This led to development of the failed Apple Lisa in 1983, followed by the successful Macintosh in 1984. In addition to being the first mass-produced computer with a GUI, the Macintosh instigated the sudden rise of the desktop publishing industry in 1985 with the addition of the Apple LaserWriter, the first laser printer to feature vector graphics. Following a long power struggle, Jobs was forced out of Apple in 1985. After leaving Apple, Jobs took a few of its members with him to found NeXT, a computer platform development company specializing in state-of-the-art computers for higher-education and business markets. In addition, Jobs helped to initiate the development of the visual effects industry when he funded the spinout of the computer graphics division of George Lucas's company Lucasfilm in 1986.The new company, Pixar, would eventually produce the first fully computer-animated film, Toy Story—an event made possible in part because of Jobs's financial support. In 1997, Apple purchased NeXT, allowing Jobs to become the former's CEO once again. He would return the company, which was on the verge of bankruptcy, back to profitability. Beginning in 1997 with the "Think different" advertising campaign, Jobs worked closely with designer Jonathan Ive to develop a line of products that would have larger cultural ramifications: the iMac, iTunes, Apple Stores, the iPod, the iTunes Store, the iPhone, the App Store, and the iPad. Mac OS was also revamped into Mac OS X, based on NeXT's NeXTSTEP platform.